Life as a Pilgrimage to the Divine | Fourth Dimension Inc. The Indian paradigm of development based on spiritual pragmatism and a balanced vision of life has a living relevance for the present and future. Spiritual pragmatism; four aims of life; four stages of life; life as a ladder to the spirit. The foundation of Indian vision of development is the intuition of a Divine Consciousness beyond Mind, which is within everyone and everything, and has become all that is in the Universe, the One without a second. This Divine Unity is the Alpha and Omega of all existence. Our individual mind, life and body are the expressive instruments of this spiritual Reality and all the energies in man, life and Nature are multiform energies of the Spirit. In Indian religion, this Divine Reality is not merely an object of philosophical speculation or religious veneration but made the foundation of a spiritual pragmatism for the transformation of human life. This Divine Reality has to be not merely thought or worshipped but lived, made real, concrete and experiential to our human consciousness and life. This brings us to the first pragmatic question, why? Why we have to seek this Reality? Because it is the goal of human life and the source and substance of everlasting peace, harmony, perfection, fulfillment and all higher values like truth, beauty and goodness. The second pragmatic question is How? How to discover this Divine source of perfection within us? The Indian answer is yoga. The Indian mind tested, experimented and evolved a multitude of yogic paths and methodologies for making this spiritual Reality concrete, real and living to our consciousness and life. We may briefly sum up this Indian gospel of spiritual pragmatisms in this way: there is a spiritual consciousness beyond mind and within each one of us which can transform human life. To discover, grow into and live in the consciousness of this one Spirit and Self in all and to make the individual and collective life a living image and manifest expression of the Spirit is the highest aim of Indian culture. 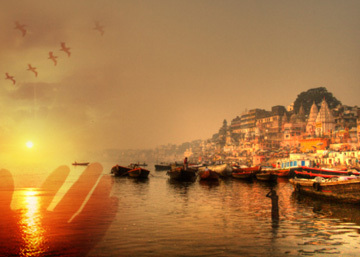 The spiritual and cultural history of India is a glorious story of the discovery of the Spirit and the great attempt to mould the individual and collective life in the light and power of the higher values of the Spirit. For realizing this spiritual vision in the individual and collective life, Indian culture evolved two schemes: first is a system of values called Purushartha, made of the Four Aims of Life and an institution called Ashrams made of the Four Stages of Life. Every human being, Purusha, has four legitimate needs, aims or motives. First is the fulfillment of material and economic needs, Artha; second, satisfaction of vital desire and enjoyment Kama; third is the need for knowledge, ethics, values, ideals which leads to mental, moral, aesthetic and cultural development, Dharma; fourth is the highest need for spiritual growth and perfection, Moksha. These aims correspond roughly to the physical, vital, mental and spiritual needs of the human being. They form a system of shared values, accepted almost by all the sections of Indian Culture. Thus we can see that Indian culture is not otherworldly and ascetic as it is normally understood, especially in the West. The legitimate needs and desires of man are not rejected but accepted and given their right place in an integrated evolutionary perspective. Life is not denied, but used as a means and field of experience for the evolutionary progress of the soul. The needs and desires of each level of the human being have to be fulfilled before he can rise to a higher level. The satisfaction of the natural needs and propensities of our physical, vital and mental being and the fulfillment of our duties and responsibilities are not denied in an ascetic spirit; they are accepted as indispensable parts of our evolutionary growth and development. But Indian culture insists that there must be balance, restraint and discipline in whatever we do. The fulfillment of the Artha-Kama needs and desires of the individual and community must not be allowed to degenerate into greed and lust. Even in the satisfaction of the desires of the lower nature, or in the fulfillment of our social function there has to be the governing control of the enlightened reason and will and the uplifting guidance of some mental, moral, aesthetic and professional values or in other words the discipline of Dharma. In all these stages of evolution, the individual and the community have to be constantly reminded that neither Artha nor Kama nor even Dharma is the ultimate aim of life but only a preparatory stage of progress towards the spiritual aim of Moksha. This spiritual aim, its meaning and significance have to be constantly kept alive in the individual and communal mind so that they are permeated with the aspiration to realise this spiritual goal and, when they are ready and well-equipped, the higher spiritual values find a ready acceptance and self-expression in the society. This is the Indian scheme of human development. Now what are the “practical” implications of this Indian vision of human development to the modern society? How to apply this spiritual vision of life to its progress and development? In principle, the Indian vision of development demands an upward transference of the motives and aims of development from the physical and vital levels to the moral and spiritual levels, that is from the Artha-Kama motives and aims of economic development, vital enjoyment, political expansion and military strength to the Dharma-Moksha aims and motives which lead to the moral, cultural and spiritual evolution of the community. This means the primary aim and motive of development should be the self-discovery of the spiritual self of Man in the individual and the collectivity and the progressive manifestation of its higher law and values of Unity and Harmony in the society. In practice, this involves a conscious and planned effort towards a reallocation of the resources and the creative energies of nations for the realisation of these higher aims and the creation of a new social order based on these higher motives. But we must remember here that this does not mean abandonment of the lower Artha-Kama motives but only a shifting of the priorities of development to higher levels of motives and values and subordination of the lower to the higher aims. For example, India and many of the developing countries of the world still need a lot of development in the economic, social and political sphere. But even these lower aims can be better pursued if the development effort is inspired by the greater motives and aims of a higher level of consciousness. The other important concept of Indian culture is the four Ashrams or the stages of life. The first stage is Brahmacharya, the stage of the student life; second is Grihastha, the stage of the householder; third is the Vanaprastha, stage of the “forest dweller” fourth is Sannyasa, the stage of the renunciate. Let us look at this classification deeply and closely going behind the words and forms to the psychological truth behind them. The first stage of Brahmacharya is the life of the student. In ancient India, education is not merely a matter of information and knowledge or acquiring professional skill to earn a living but learning the Art and Science of living, which means to know the highest aims and laws of life, Nature and Spirit and harmonise human life with these higher laws and aims. In a psychological or yogic perspective Brahmacharya means transformation of sexual energy into vital, intellectual and spiritual energy. So in this first stage the student is taught the discipline by which this inner transformation is accomplished. The next stage is that of the Samsari, the householder. In this phase, the individual puts into practice what he has learnt during his previous life. He satisfies his Arthakama needs and motives, takes up and fulfills his civic and social responsibilities to the family and community, all these under the restraining guidance of some higher moral standards of Dharma of his species, type, profession, group or community, with a conscious understanding that these are not the highest aims of life but only the indispensable preparation and training for the realisation of the highest spiritual aim of Moksha. If the individual goes through these two stages with the full understanding of their meaning and significance, by the time he reaches the end of the second stage, say around the age of fifty, he has fulfilled most of his social responsibilities, he has the full experience of life, his faculties are well exercised and developed, and his basic natural needs, desires and cravings are satisfied. He is now mature enough to pursue the higher spiritual aim of life and devote his attention exclusively or more and more to these higher aims. At this advanced stage, the Indian culture counsels the individual to gradually relinquish his civic, social and professional responsibilities, transfer them to competent young men, and retire into seclusion to contemplate on the higher aims of life. Here the extreme view holds that the individual, at this stage, has to renounce life and go to the forest or an Ashram for the full-fledged pursuit of the contemplative life. It is this view which gives the name of Vanaprastha, “forest-dwelling”, to this third Ashram. But the less drastic and more balanced views counsels that the individual may remain in life, but without any active interest and responsibility in society, as an experienced and wise veteran, offering the wisdom and knowledge of his experience to the community, especially to the younger generation. This Indian perception has specific relevance for the modern age. One of the disturbing features of contemporary society, especially in Indian politics, is the phenomenon of old men, who are in positions of power in higher levels of the hierarchy, obstinately clinging to their power and refusing to delegate their power to the younger generation. And the result is, not only the younger men are denied opportunities for professional and personal growth, but the society as a whole is deprived of the fresh outlook, creative dynamism and vitality of youthful leadership. In the royal traditions of ancient India the ruling king normally relinquished his throne and royal responsibilities at the age of around fifty and handed over the responsibility of government to his son or whoever was chosen as the prince. But long before this transfer of power the young sovereign was groomed for his future responsibilities by a rigorous “in-house” education, training and discipline and followed by “on-the-job” training by assigning to him important administrative and military responsibilities. Normally the prince took charge at the age of 25 to 30, and the king retired at the age of around fifty, not to relax and enjoy the life of retirement, but to pursue the higher aims of life. In this advanced stage of his life he may go to the forest or the monastery, renouncing life altogether, or remain in the palace free from all responsibilities, preparing himself for the spiritual life, giving his guidance and advice to the young sovereign. The modern management concept of Line and Staff functions may help us to understand the significance of this Indian practice. Line positions are those which involve power and responsibilities for decision-making and execution, whereas staff positions involve advisory functions giving expert and specialist guidance to line managers. Line managerial positions require, apart from the qualities of intelligence needed for making right decisions, a lot of youthful vitality and energy to get the decisions executed in the organisations. But staff positions, which do not have the power and responsibility for making or executing decisions, require not much of vitality and energy, but more of the qualities of intelligence and therefore can be staffed by older men. The vital energy of youth is normally driven by the motives of ambition, success, achievement and enjoyment. This youthful vital energy of the community has to be channellised at the right psychological moment in “line-management” positions of the society. On the other hand, the vitality in the old is waning, though in many cases, their intelligence may be sharp, active and creative. So it is easier for the old-especially those who had gone through all the joys, experiences and responsibilities of the samsaric life-to renounce the desire for wealth, power and enjoyment and turn their intelligence and energies to the pursuit of some higher spiritual aims. This is exactly what the Indian approach to human development attempts to do. It tries to solve at one stroke the problems of the young as well as the old. The energies of both the old and young are channellised in appropriate directions at the right psychological moment of their life. The last stage is Sannyasa, the life of the absolute renunciate, the wandering ascetic, or the cloistered monk, one who has no outer responsibility whatsoever and who has dedicated the whole of his life exclusively to the spiritual pursuit. Indian culture gave the highest respect to such spiritual renunciates and this quality of renunciation still holds a great motivational appeal for the Indian mind and for the Indian masses. This is in short the ancient Indian synthesis on human and social development. The whole of life is viewed as an evolutionary pilgrimage to the Spirit, moving towards self-realisation in the divine and universal Self of all. All individual and collective endeavour of Man, his society, economics, politics, religion, culture and spirituality is viewed as an unconscious or conscious striving towards this spiritual goal. All human life is a field of education, training and experience which gradually prepares the human soul for the highest goal. The primary aim of Indian socio-political thought and practice is to evolve a social system which will help the individual and communal life of man to grow consciously towards this highest spiritual ideal.